Perhaps even more significant than population growth for the growth in commodity markets is the fact that it’s accompanied by the largest urbanization movement the world has ever seen. In the early 20th century, according to the United Nations (UN), less than 15 percent of the world’s population lived in cities; by 2005, that number jumped to 50 percent — and shows no sign of decreasing. As a matter of fact, 60 percent of the world’s population is expected to live in urban areas by the year 2030. The number of large metropolitan areas with 5 million or more people (mega cities) is skyrocketing and will continue to climb for much of the century. The number of cities expected to have 5 million inhabitants by 2015. When you compare that with the growth in the number of cities with 5 million people from 1950 to 2000, you quickly realize how staggering this growth really is. Urbanization is highly significant for commodities because people who live in urban centers consume a lot more natural resources than those who live in rural areas. In addition, more natural resources are required to expand the size of cities as more people move to them (rural to urban migration) and have more kids (indigenous urban population growth). More natural resources are required for the roads, cars, and personal appliances that are staples of city life. Industrial metals such as copper, steel, and aluminum are going to be in high demand to construct apartment buildings, schools, hospitals, cars, and so on. So investing in industrial metals is one possible way to play the urbanization card. 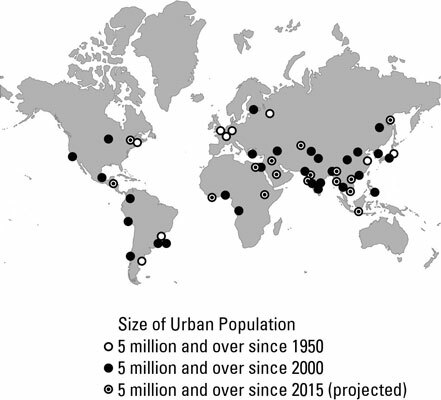 As you can see, the largest urbanization is taking place in the developing world, particularly in Asia. As more Asians move from the countryside to large urban areas, expect to see huge demand from that part of the world for raw materials to fuel this growth.